Gardner Dozois recommended James Crumley’s The Last Good Kiss to me as the best hard-boiled detective novel written in the last ten years. With that kind of recommendation, I would have been hard-pressed to pass it up. And Dozois is correct, as far as I can tell. Crumley’s C.W. Sughrue has that quality that I thought was lost when I finished reading the last Dashiell Hammett story. But Crumley isn’t just playing off of Hammett and Raymond Chandler, although he is firmly in their tradition. 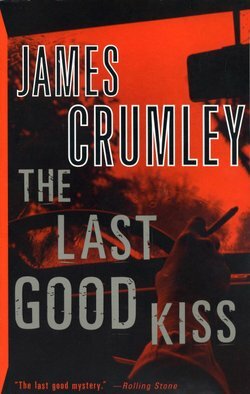 Crumley is as post-modern as they come, and knows that life and people are as sleazy as anything James Ellroy or Andrew Vachss has put to the page (not to even mention the real thing). C.W. Sughrue is hired to track down a derelict author who’s on a drinking binge by the author’s ex-wife. What begins so simply quickly soon complicates–I can’t quite explain how complicated it becomes, either. There’s a point in the middle of the novel where I said to myself, “Well, that’s it. We’ve had the set-up, the complication, a little goose-chase, a climax, and here we are.” But I was only halfway through the book. Contrary to normal novel structure, Crumley leaves you hanging within the denouement while he sets up an entirely new climax not once or twice, but three times. Crumley has taught literature in Texas, Arkansas, and Montana, and understands the directions recent fiction has taken. Although he’s not about to give up the traditional, he has assimilated some of the modern tricks. The ending, in particular, is something that I doubt you would have seen in a previous decade. All in all, Crumley is a voice that is worth looking out for. On the basis of The Last Good Kiss, I plan to search out his other two novels and his short story collection. I recommend that you do, also.